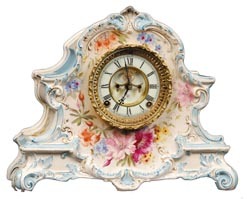 Ansonia Clock Co., Royal Bonn, "LaNord", ca 1904. Decorated in Baby Blue, various pink-red shades, some gold. It is 11.75" high, 14.5" wide. Ly-Ansonia, page 607.